Congratulations to Diane Madaio and Justin Olive, the 2018 recipients of the Janet L. Wells CSF Faculty Innovator of the Year Award! The award recognizes faculty who demonstrate a commitment to educational innovation by bringing transformative learning experiences to our students. 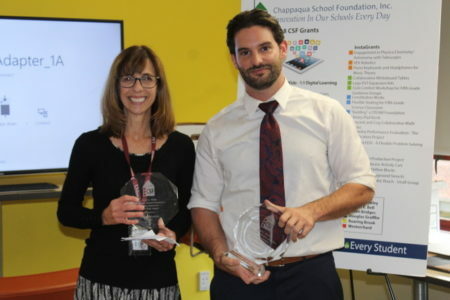 CSF is proud to recognize Ms. Madaio and Mr. Olive for their commitment to innovation, and we are grateful to them for sharing their ideas and creativity with our entire community. Ms. Madaio and Mr. Olive were each nominated for their ability to inspire and to instill a love of science in their students, even those who may not have previously had a passion for the subject. Ms. Madaio uses unconventional and innovative teaching methods to engage her students and worked with CSF last year to provide classroom materials to foster active and collaborative learning opportunities. In addition to innovative teaching in his own classroom, Mr. Olive serves as a resource to inspire other teachers to push their teaching practices. In his capacity as a student leadership advisor, Mr. Olive worked with leadership council students and CSF to design and create an outdoor learning classroom for the benefit of all teachers and students at Bell. Congratulations and thank you to Diane and Justin!